First of all, let me preface this with the fact that I do not say things like, “I left iPhone at home.” Like the way you’d hear a mother say, “I left Johnny at home. Social Services will have my neck.” i.e. My iPhone is not a person or being like Apple wants me to think it is (just read a manual or listen to speeches Steve Jobs has given regarding it. You’ll know what I’m talking about). It’s a machine and as such will have an article preceding it. So, with that said, I love my iPhone! It’s a 4s and it tucks me into bed every night and sings me lullabies. And as a photographic tool, there is no denying how powerful and truly game changing it is. For photography, I sincerely believe we’ve entered a whole new era with this phone. The picture above was taken on it using it’s 8mp camera, AutoStitch, Snapseed, and a minor off-board edit with Photoshop (some nasty street lights had to go). But make no mistake, this picture couldn’t have happened without my trusty new friend. I mean phone. Long story short, I’ve decided to start taking walks at work during lunch in an effort to bring my equator closer home. Along the way, I’ll snap pictures around the city and tweak them all on the phone, WHILE I’m still walking around. Then, I’ll post to FB and/or email to some unsuspecting person all WHILE I’m still walking around, bringing the ol’ equator to a decent orbit. As a hopelessly creative type, this is beyond wonderful because it allows me to get outside and interact with the world and create something, anything right there on the spot. I’m in heaven. Truly. 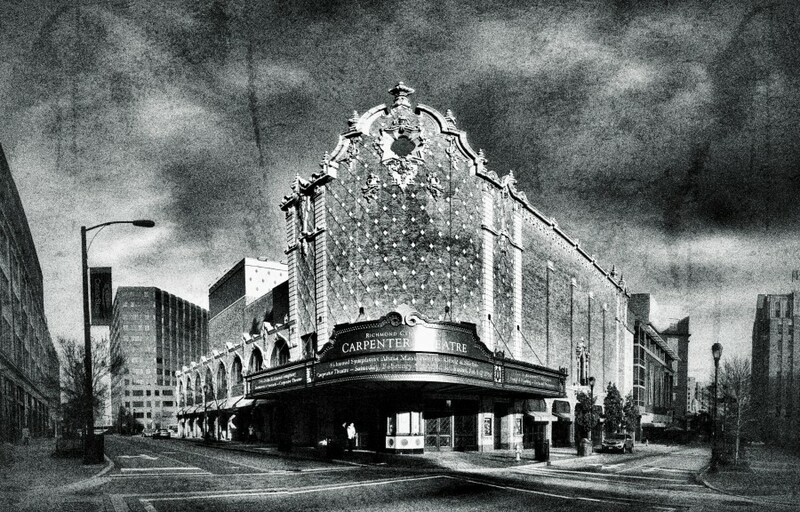 Now, the picture: it’s the Carpenter Theatre. It’s black and white with some cool Snapseed treatments. The building is awesome and you need to go there and purchase some tickets to see the equally wonderful, revitalized inside. Now, I have to go get ready for dinner and venture out somewhere and maybe capture some more scenes with my little buddy, my iPhone.